Prime Minister Narendra Modi on Monday held a roundtable meeting with the CEOs of top global companies ahead of this year's World Economic Forum. "Narrating India's growth story and presenting exciting opportunities for global business in India at #Davos, PM @narendramodi hosted a roundtable meeting with CEOs of top global companies," Ministry of External Affairs said in a tweet. The Indian Prime Minister will also interact with CEOs of Indian companies separately. 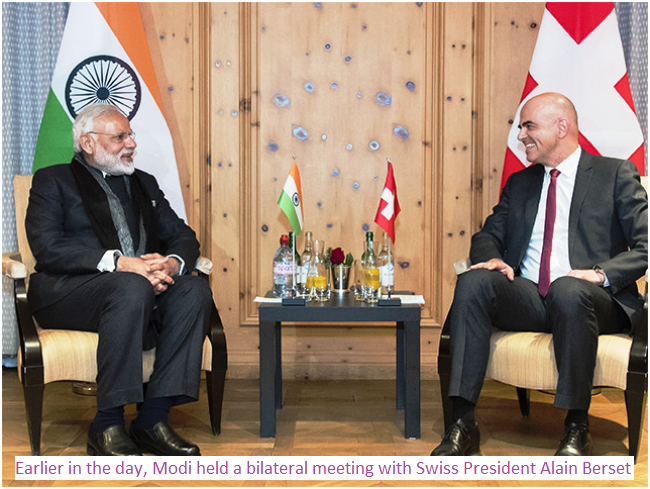 Earlier in the day, Modi held a bilateral meeting with Swiss President Alain Berset who greeted the prime minister with a warm handshake in this town in the Swiss Alps before leading the Indian leader to the meeting. This is Modi's second visit to Switzerland in nearly two years after his visit in June 2016. Modi is the first Prime Minister from India to participate in a forum meeting in two decades after the then Prime Minister H.D. Deve Gowda in 1997. Modi will interact with 120 members of the International Business Council, which is a part of the WEF. Modi, in the course of his 24-hour visit to Davos, is also scheduled to hold a bilateral meeting with Sweden Prime Minister Stefan Lofven on Tuesday.